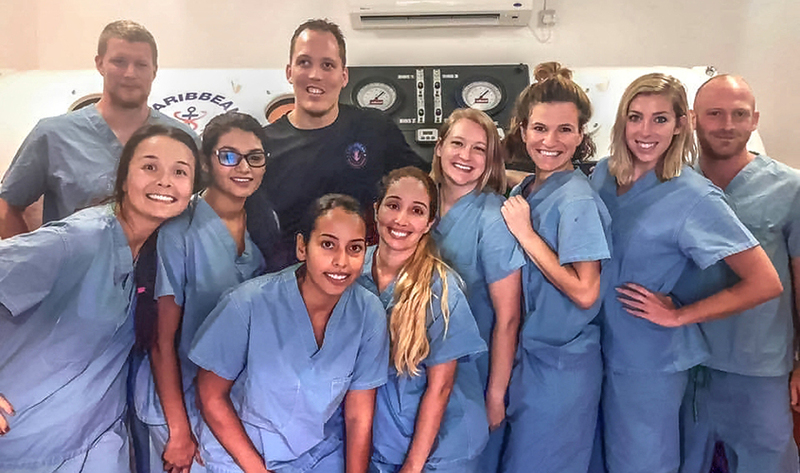 Each May and December, immediately following final examinations, first- and second-year students at St. George’s University School of Medicine can participate in a pair of Grenada-based selectives in hyperbaric medicine. In addition to intense study of the theoretical underpinnings of hyperbaric therapeutics, students gain practical experience, with a focus on chronic wounds associated with diabetes. Late in 2018, however, the participants faced an even more dramatic challenge. During a routine training session for the hyperbaric students at St. Augustine’s Medical Services (SAMS), a Grenadian fisherman showed hemiparalysis and urinary retention. Confronted with decompression sickness-related dysfunction of the brain and spinal cord, the students confidently and professionally rose to the occasion. Over approximately seven hours of supervised effort, they successfully deployed their fresh knowledge and skills, sparing their patient from a lifetime of profound disability. When completed in succession, the selectives constitute a course that is approved by the American College of Hyperbaric Medicine (ACHM) for progression toward the professional credential of Certified Hyperbaric Technician (CHT). Dr. Kirkby worked with Lutz “Joe” Amechi, MD ’93, the medical director at SAMS, to bring hyperbaric medicine to Grenada in 2017. Previously, the nearest chamber to treat diving-related injuries resided in Barbados. The installation of the chamber at SAMS facilitated the development of the selectives, which supplement the preclinical education that medical students receive at SGU. Dr. Tyler Sexton, who studied under Dr. Kirkby, supplied Grenada’s hyperbaric chamber and is the primary instructor for the selectives. 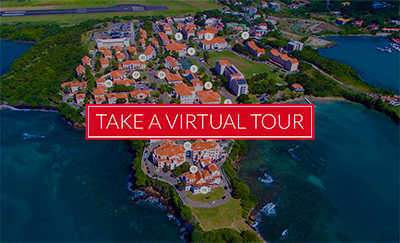 He is also a visiting professor at SGU and the CEO and medical director of Caribbean Hyperbaric Medicine. 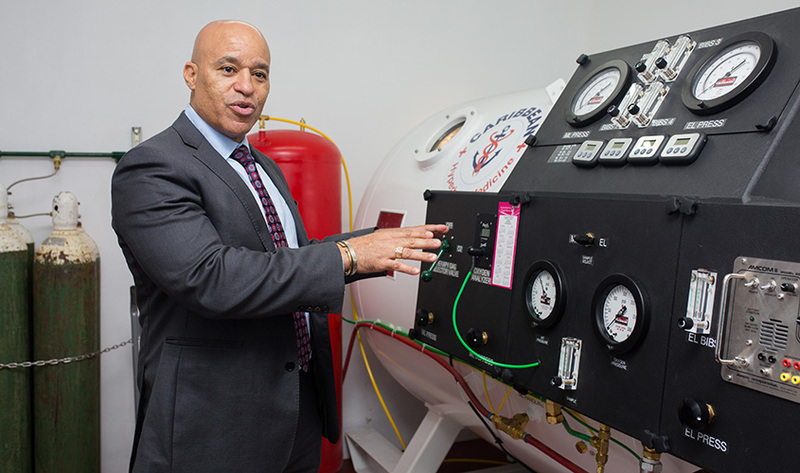 Dr. Lutz “Joe” Amechi, MD ’93, resident physician and managing director of St. Augustine’s Medical Services (SAMS), introduced the nation’s first hyperbaric chamber and a 64 slice CT machine in 2017. St. George’s University is partnering with SAMS to provide medical students with a clinical selective in hyperbaric medicine.